← What Do “the People” REALLY Think? The oral histories, photographs, audio and video can be accessed via the Women’s Marches 2017 Collection in the GSU Library’s Digital Collections. 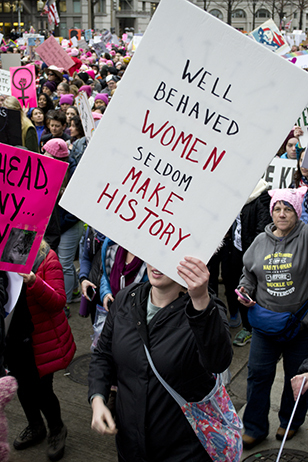 Digital content will also be shared with the national Women’s March on Washington Archives Project, which is the brainchild of the Women Archivists Section of the Society of American Archivists. If you or someone you know would like to be interviewed or make a donation, please contact the Women and Gender Collections archivist, Morna Gerrard ((404) 413-2888 / mgerrard@gsu.edu) or simply read the instructions on the Research Guides, complete the donation form, and make your donation. This entry was posted in Communication, Digital Collections, English, For Faculty, For Graduate Students, For Students, General News, History, Oral Histories, Political Science, Primary Resources, Research Guides, Special Collections & Archives, Uncategorized, Women's, Gender, and Sexuality Studies. Bookmark the permalink. I took my adopted Chinese daughters age at the time was 17 and 20.